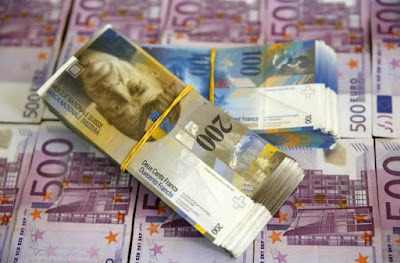 News that Switzerland's reserves rose to a new record high of CHF602.1 bln in May from CHF587.9 bln in April spurred talk that the SNB has been intervening covertly. One media account cited a trader calling the intervention as "massive." We are skeptical. Given the massive holdings of foreign currencies, we suspect that the swing in valuation likely accounts for an apparent increase in reserves. The reserves are reported in Swiss franc, which fell against both the euro and the dollar in May. Using the allocation the Swiss National Bank published for Q1, the dollar accounted for a third of Swiss reserves and the euro accounted for 42%. The franc fell 3.4% against the dollar in May. That alone accounts for nearly half of the change in the franc-valued reserves (1.1% of the 2.4% increase). The Swiss franc lost 0.6% against the euro last month. That translates into another 0.25% increase in SNB reserves. The euro and the dollar account for 75% of the reserves. Sterling and the yen equally combine for another 14% of the Switzerland's reserves. Sterling's 2.5% appreciation against the franc more than offsets the yen's 0.4% fall against the franc. The two combine for a contribution on par with the euro for the change in Swiss reserves. The remaining 11% of Switzerland's reserves are in a wide range of currencies. The Canadian dollar has a 3% share of Swiss reserves, leaving the Australian dollar, Danish krone, Chinese yuan, Swedish krona, and Singapore dollar to account for about 8%. These currencies were mixed against the franc. Not knowing the weights of these last six currencies, and small holdings of additional currency exposures in the equity portfolios, it may be prudent to assume that net-net these currencies were neutral for the valuation of Swiss reserves. This exercise shows that changing valuation of currencies can account for the roughly two-thirds of the increase in the franc-valuation of Switzerland's reserves. The adjustment for valuation, however, should not stop with the foreign exchange market. The SNB reports that about 80% of its reserves are held in foreign bonds (68% in government bonds and 12% in other bonds). Bonds rallied in May. The Swiss National Bank holds invests a fifth of its reserves in equities. On May 20, the euro was at its highest level against the Swiss franc (~CHF1.1130) since early February, having risen steadily since early April (from ~CHF1.0840). The euro has broken down over the past two sessions. It finished last week near CHF1.1090 and traded as low as CHF1.0970 today. Since May 23, the euro has closed higher against the franc only three times (12 sessions). Many ask if the Swiss franc may be drawing strength of from Brexit fears. While it is possible that some seek protection by buying the franc, the correlation suggests that statistically it might not be particularly helpful. Over the past 60 days, the correlation on a percentage change basis is less than 0.1, and it does not improve over the past 30 days. When conducting the correlation on the level of the euro-franc cross and sterling (rather than percent change), the 60-day correlation rises to 0.73. This means that two have moved in the same direction nearly three-quarters of the time. That relationship breaks down entirely over the past 30-days when the correlation of the value of the two currency pairs falls to minus 0.18. This means that more recently, sterling and the euro-franc cross move in opposite directions like they are today (roughly five of the past 30 sessions). In conclusion, we make two points. First, the increase in Swiss reserves appears to be explained by valuation swings not be "massive" intervention. This is the same analytic process we use to understand Chinese reserves as well. The PBOC is not nearly as transparent as the SNB, but the $28 bln in China's reserves reported earlier today was also likely a function of valuation and capital outflows (though the yuan rose 1.6% against the dollar in May). Second, for asset managers and corporations, the most efficient way to position for the UK referendum is not taking on exposure to a different currency, like Swiss francs, even if one's charter allows for naked currency positions. The most direct path is often the best and least expensive. A recent survey by Morningstar found that nearly half of the 62 European-domiciled funds that investment in all size companies globally reduced their exposure to UK equities in the 12-months through April. However, almost as many (28 vs. 30) increased exposure to UK stocks and the remaining four did not change their UK equity exposure.